Born in Naples, Maria Grazia Schiavo studied with R Passaro at the Conservatory in Naples, graduating with honours. She won numerous competitions, including the Santa Cecilia in Rome and first prize in the Clermont Ferrand International Singing Competition. She made her debut on stage with Roberto De Simone, performing the leading role in the latter’s La gatta Cenerentola in the most important theatres in Italy and abroad. As well as specializing in chamber and Baroque music, her renditions of the title role in Lucia di Lammermoor in Turin, Konstanze in Mozart’s Die Entführung aus dem Serail in Rome, and Jommelli’s Demofoonte in Salzburg and Paris with Riccardo Muti have established her as one of the most interesting sopranos of her generation in the bel canto repertoire. 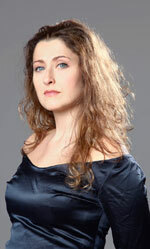 Maria Grazia Schiavo has performed with many leading early music groups, including Le Concert des Nations and Jordi Savall, Europa Galante and Fabio Biondi, La Cappella de’ Turchini and Antonio Florio, Accademia Bizantina and Ottavio Dantone, Concerto Italiano and Rinaldo Alessandrini, Al Ayre Español and Eduardo López Banzo, and La Risonanza and Fabio Bonizzoni. She has made numerous recordings, including for Hyperion the role of Venere in Auser Musici’s recording of Cesti’s Le disgrazie d’Amore.